Due to health reasons, Martinez had a tough season last year; by wRC+, it was the worst offensive season (77 wRC+) of his career. On top of that, the shift really ate him up. When shifted against, he posted an unsightly 37 wRC+. Again, 2015 was a bad year for Victor. 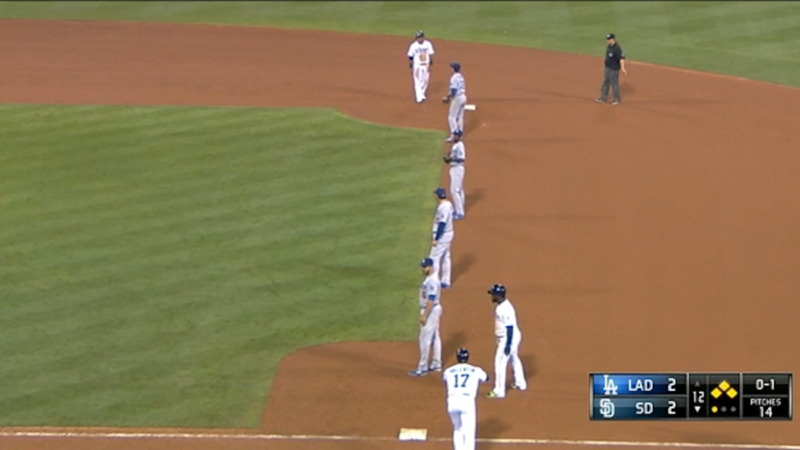 As noted above, the bunt is one strategy for beating the shift. Trying to hit the ball to the opposite (i.e., left) field is another. Trying to hit the ball in the air over the shift is a third. For most batters, that’s it, and for most batters, none of that is working too well. Martinez has a fourth option, though: he could hit right-handed against right-handed pitchers. Defenses rarely shift against right-handed hitters, and Martinez shows clear pull tendencies from the right side, making him a bad shift candidate when hitting from that side. In other words, if Martinez only hit right-handed, teams probably wouldn’t shift on him at all. How’s that for beating the shift? Some argue that the shift’s advantage is less about fielding anticipated ground-ball patterns and more about trying to force hitters to do things– bunt, hit to the opposite field– they aren’t used to doing and aren’t good at. The shift, or the threat thereof, thus is more powerful than it may initially appear. For any player, changing strategies is likely to have a cost. For Martinez, we should begin with the assumption that he is switch hitting in an optimal manner. After all, he has been an excellent hitter by doing things his way for fourteen seasons. The defensive shift is a new strategy, though, so it presents a valid reason for reassessing Martinez’s approach. In order to justify a change in strategy, the net benefits of the proposed strategy obviously need to outweigh the net benefits of the incumbent strategy. While limiting Martinez to right-handed hitting should avoid entirely the shift’s direct costs, there are costs associated with Martinez hitting only from the right side, and they are more difficult to estimate. We know he hits lefties well from the right side (119 career wRC+). His 111 wRC+ hitting right-handed against right-handed pitching also is above-average, but he’s barely taken that approach (just nineteen of over 6600 career plate appearances), and he hasn’t done it at all since 2011, when he did it just three times; that 111 wRC+ number is almost meaningless. We really don’t know much at all about how Martinez would perform if he started hitting right-handed pitching as a right-handed batter. It almost certainly would be worse than his overall career performance, as well as his performance as a right-handed batter against left-handed pitching, because almost every player hits worse against same-handed pitching, and because all changes at least have adjustment costs, maybe especially so late in careers. The good news for Martinez is that it might not matter. Would a 37 wRC+ against the shift justify a drastic change in strategy? Almost certainly. What about a 112 wRC+ against the shift? For a career 122 wRC+ hitter, no way. Martinez posted 112 wRC+ against the shift in 2014 in almost exactly the same number of plate appearances in which he faced the shift (and registered that 37 wRC+) in 2015. In fact, Martinez wasn’t great as a left-handed hitter under any defensive circumstances in 2015, his injuries– chiefly, a bad left knee– making it nearly impossible for him to generate any power whatsoever from the left side. Yes, 2014 was a career year he’s unlikely to replicate in his later thirties, but (deep breath), assuming he stays healthy, there seems to be little reason for Martinez to deviate from his switch-hitting strategy. If the injury bug bites him again (he did suffer a “mild” left hamstring strain in spring training but started the regular season just fine, thank you very much), he may want to reconsider. With all systems go for now, though, we probably can leave the professional hitter to his work. This entry was posted in ALDLAND and tagged boston, brooks baseball, david ortiz, detroit, fangraphs, mlb, red sox, tigers, victor martinez by AD. Bookmark the permalink.